Ad blockers are great but sometimes they block desirable content or content doesn't load because of anti-adblocker technology on the site. If a website is not loading properly and you have a adblocker installed, try turning off the adblocker for that site. These instructions apply to uBlock or uBlock Origin installed on Chrome, Firefox, Safari or Edge. Try to load the affected website. It's ok if it doesn't load as expected. 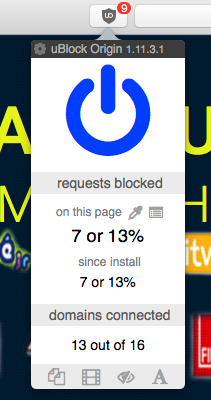 In the browser menu (next to address bar), click uBlock Origin. 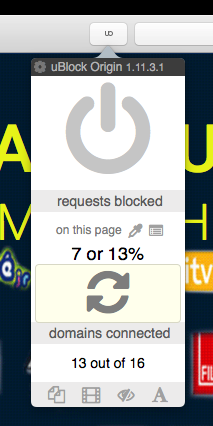 In the uBlock Origin menu, click blue power button to turn uBlock off for this site. uBlock Origin indicates it is disabled when it's icon is grey. In Safari, all icons are grey so instead the icon changes shape as seen below. The website should now load including ads, trackers and other potential nasties. There is an issue somewhere else. Try isolating the issue by changing (one at a time) conditions such as the website, browser, device or internet connection. For instance the website, browser, device and internet connection you're using right now is working. If you're determined to load websites without ads, there is a trickier method. Read on for a simple solution to disable the adblocker for a certain website. Angus is here to help.